By a large margin, most people use Electionbuddy for elections. 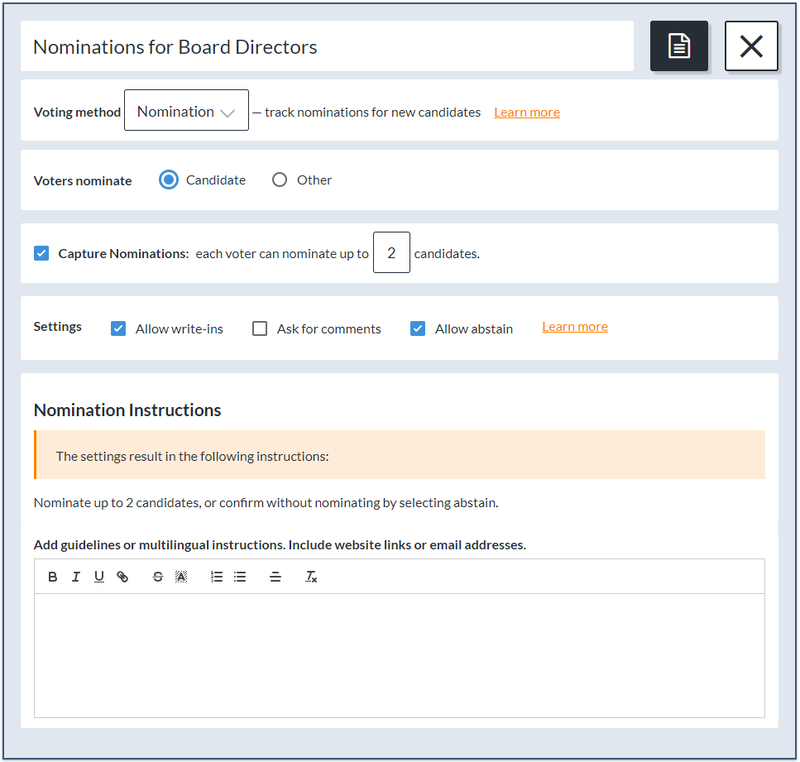 But, did you know that Electionbuddy also has a feature specifically for the nomination process before an election as well? The election start date/time - the start date is included in the announcement notice to let voters know when voting opens. The announcement start date/time - when the nomination period begins, and announcement notices are sent to voters. The announcement end date/time - when the nomination period is over. This results in a ballot with two spots for writing in the names of the candidates being nominated. The notification types available for an Announcement are the same as a regular election; however, please note that the default text is different. The rest is the same as a regular election as well: you put in your voter list, review all the components of your Announcement setup, and get it started! Announcements are not included with an election, and an election does not come with an announcement; they are independent and you pay for each (i.e. if running a nomination and an election with Electionbuddy, you pay for the announcement and then you pay for the election). Announcements are priced identically to elections; please refer to our pricing guidelines for more details. If you need to be able to associate nominators with their nominees, use our "Poll" setting in "Voter Anonymity". For more details, please see our related article on the "Voter Anonymity" setting.